We are learning so much, some days our brains are as tired as our legs at the end of the day. But it’s not all serious and sober. We laugh together too! 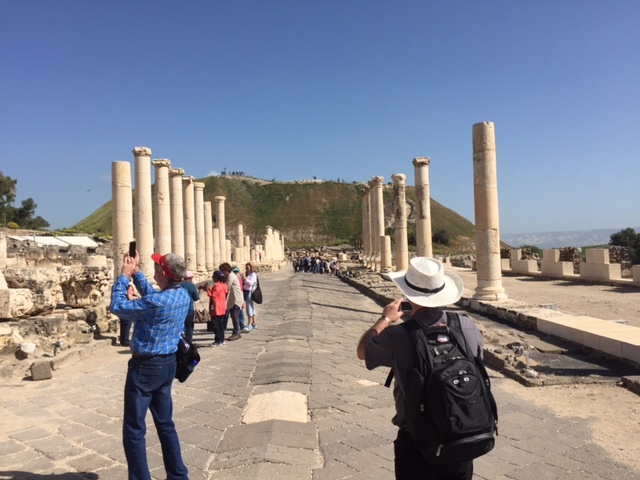 Our patient guide is a walking reservoir of biblical and archaeological information, and he never complains about the frequent need for the group to have a “restroom break.” But I did wonder about his subtle humor today at Bet-She’an when he chose this spot for a group teaching time! 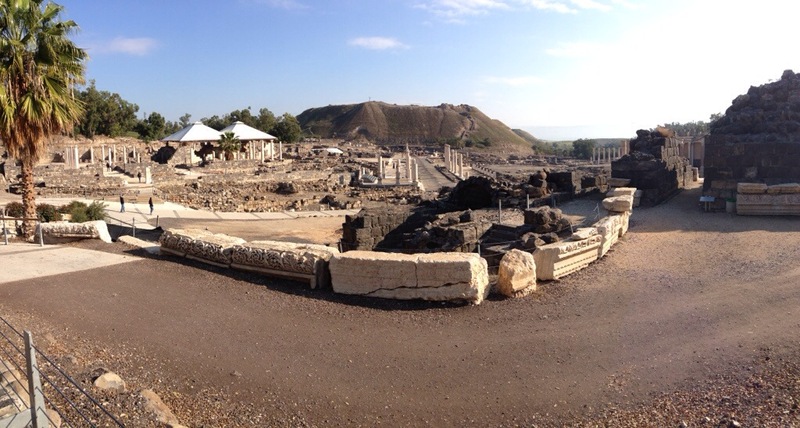 Hearing of Saul’s last days at Bet She’an was an important reminder of the very real threat of erosion in our lives. 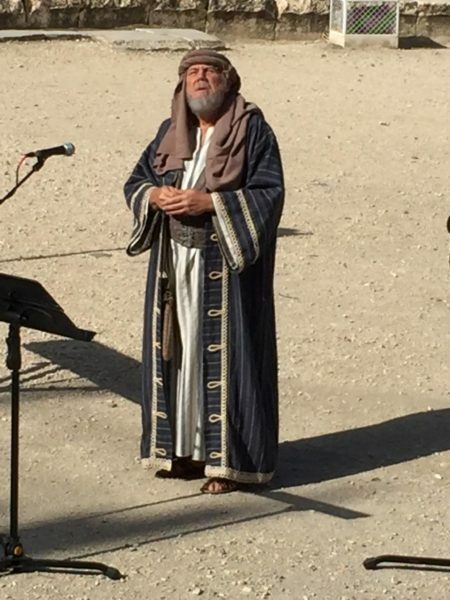 Reg Grant portraying one of the brave Hebrews who reclaimed Saul’s body from the wall. During the reign of King Saul, the Philistines controlled Beth-shan. 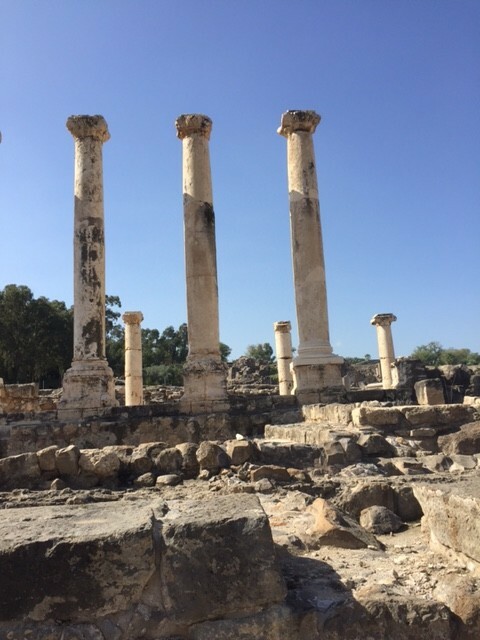 The army of Israel fought the Philistines on nearby Mount Gilboa, and King Saul and his sons were killed. Their bodies hung in effigy on the walls of nearby Beth-shan until Hebrews from Jabesh-gilead recovered them (1 Samuel 31). Tel Beth-shan in the distance, where Saul’s body hung. 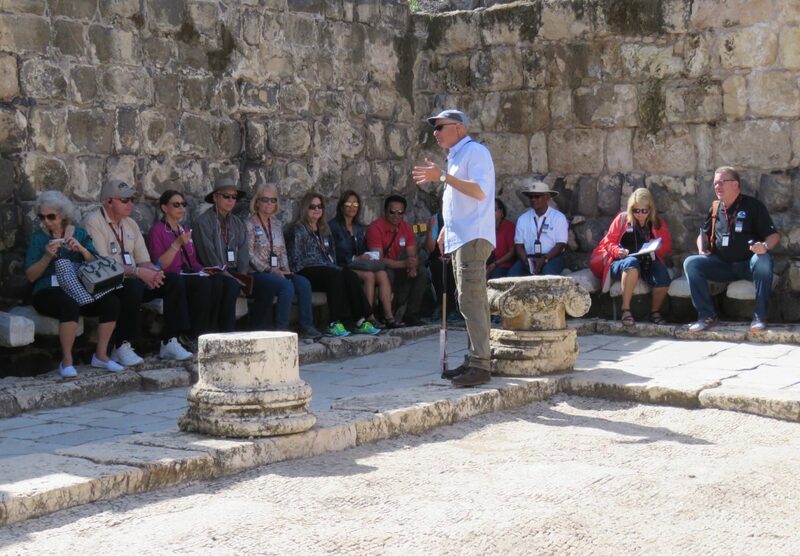 As our entire tour group sat in the theater today, Reg Grant portrayed one of these brave Hebrews who reclaimed Saul’s body from the wall. Chuck Swindoll gave a message on King Saul, which challenged each of us to evaluate our lives for spiritual erosion. Am I following God with my whole heart? Are you?